Pura Vida! Not just a greeting in Costa Rica, but truly a way of life — Pure Life! A reminder to stop, breathe and take in the spectacular surroundings in one of the most biologically-rich places in the world. strictly adhere to this policy to offset costs incurred prior to the commencement of the tour. We strongly encourage the purchase of a supplemental insurance policy to protect both you and your travel investment against the unexpected. We are happy to provide you with quotes and additional information on options. Airfare: (Very Important: Please contact us prior to booking your flight arrangements as we will have specific arrival and departure recommendations to coordinate group ground transportation in Costa Rica). Note: We are more than happy to assist you with ground transportation arrangements in Costa Rica should your flight arrive or depart outside of our recommended window for an additional fee. After arriving at the Juan Santamaria International airport (SJO) in San Jose you’ll proceed through immigration (see passport requirements), and be greeted outside baggage claim by a Mojo Active Adventures representative. We’ll transfer to our award-winning boutique accommodations (about a 3 hour drive) stopping to stretch, take photos and grab a light snack along the way. Connect with your fellow adventurers during a welcome reception and dinner later that evening. Afterwards, power down and recharge in the comfort of your own private villa. Enjoy a wholesome breakfast, then we’ll head out for a unique, birds-eye view of the spectacular surrounding canopy rainforest and Arenal volcano. 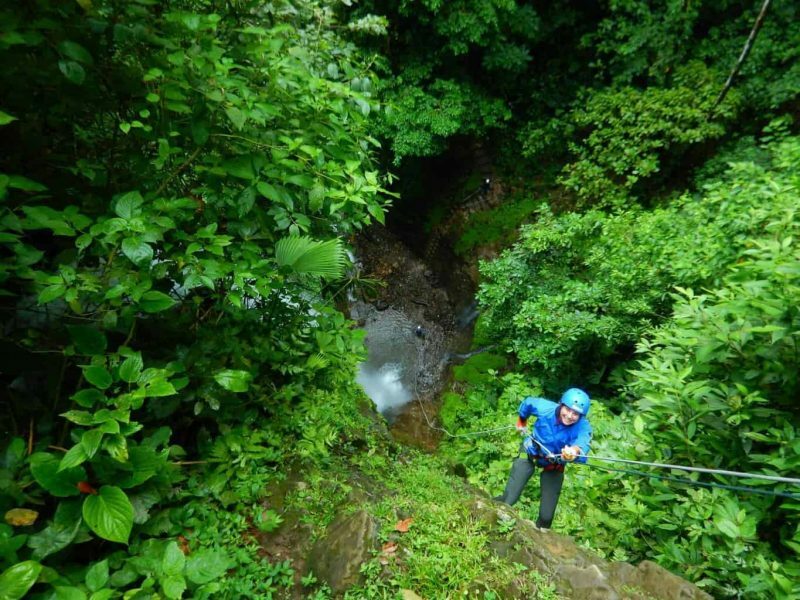 We’ll soar through the treetops via a series of 7 zip lines over spectacular gorges and waterfalls. Afterwards, we’ll visit a local Maleku Indian village to learn more about their local customs, language and traditions. Be prepared for an adrenaline-packed morning. demonstration and gourmet lunch for the group. (We’ll even keep our eyes out for a family of sloths living nearby). We’ll embrace the concept of “Pura Vida” to the fullest today. After powering up over breakfast, we’ll embark on a thrilling morning of waterfall rappelling and hiking through a spectacular rain forest slot canyon. No prior experience needed, just a willingness to have fun and go for it! We’ll be in great hands — our expert outfitters are pioneers of the sport in Costa Rica. 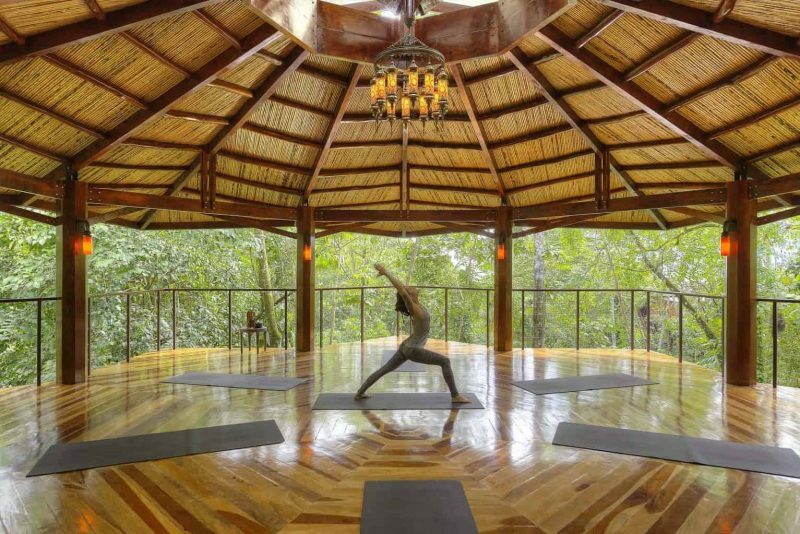 Afterwards, enjoy a delicious, authentic Costa Rican lunch then we’ll head back to Nayara Spring’s, award-winning, luxurious spa for your choice of a 60 minute massage, facial or signature body treatment followed by a group dinner. After our epic canyoneering/rainforest adventure, power back up with either extra sleep or some restorative yoga in the AM. We’ll transfer (about a 2-3 hour drive) to our “basecamp” for the next two (2) nights, Finca Rosa Blanca – a member of the prestigous National Geographic Unique Lodges of the World (outside of San Jose). Once there, we’ll enjoy an authentic Costa Rican “casado” lunch then a privately guided tour of the resort’s organic coffee farm. A private “coffee connoisseurs dinner with wine pairing” will follow that evening. After breakfast, we’ll transfer back to the San Jose (SJO) airport for our journey home. Our “basecamp” for the first part of this adventure is an award-winning, boutique resort. Featuring a cluster of secluded, private, luxury villas immersed in the lush vegetation of Costa Rica’s pristine rainforest, this ultraexclusive, adults-only property has been named the number one hotel in Central and South America by Conde Nast Traveler and one of the Best 100 Hotels in the World by Travel and Leisure. A place of breathtaking natural beauty and peaceful tranquility, the resort is located in the Arenal Volcano National Park, host to one of the world’s highest concentrations of tropical plants and wildlife. Our additional “home away from home” for the last 2 nights is a member of the prestigious National Geographic Unique Lodges of the World. It is the creation of three generations of family. For the last 30 years, the resort has focused on the highest quality of service in the hospitality industry while offering you authentic experiences with a local flavor. No two rooms are the same, featuring original artwork and luxurious, well-appointed furnishings. If you are a woman who needs to get away from either routine or a stressful life, and you are ready to have fun, some adventure, some culture, open to meet exciting different ladies… to some times step out your comfort zone and others to connect with the side of you which busy life takes away… Molly, the founder of Mojo Active Adventures, is your contact. I personally have done two trips (Iceland and Costa Rica). From luxurious stays to breath taking waterfalls. From iceberg hiking to rappelling and zip lining with incredible views. Horse back riding and SPA treatments. Meeting other wonderful women and sharing the experiences all together. Spectacular dinners and the tastes of the local farmers and home made meals (hands on!). The taste of wonderful fresh made chocolate. Not enough time to write all the small and big things that make Mojo Active Adventures my way of travel at least once a year. Small groups which makes it even more memorable. The only thing you need to do is pack (list provided by Molly) and bring your passport! The rest is being taking care of…. what else can you ask for?!! !